What is plantain flour? The green plantain bananas are used to make gluten free plantain flour which is used to make baby cereals as well as delicious gluten free recipes. If you are wondering what is plantain flour or have never heard about plantain flour before, read this page. Plantain flour also known as banana flour made from green plantains or cooking bananas is used in many Asian countries to prepare baby food like baby cereals. Banana flour is naturally gluten free and so nowadays people use plantain flour made from green plantain bananas to make gluten free recipes. Plantain flour also popularly called as banana flour is traditionally prepared from sun dried banana slices, which is then grind to produce a very fine flour which is edible, healthy and tasty with a very unique and distinct flavor. In India, we usually have homemade banana flour made from almost ripe plantains which we use to make baby food. It can be prepared just like we do with other cereals. It is also used as a natural, healthy flavoring for milk. 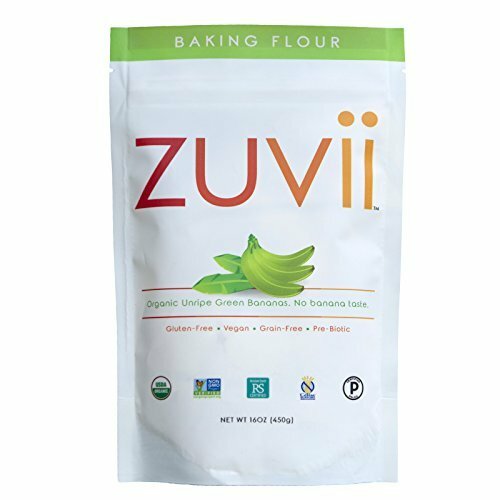 Since we only use plantains to prepare the flour, this flour is gluten free and so they are perfect for preparing gluten free recipes. We have already seen what is plantain flour. So let us see how to make plantain flour at home. If you decide to make banana flour by yourself, it is very important to choose the right fruits. I do not know which all varieties of bananas can be used to produce the flour, but I have seen mostly everyone using only the plantains. They are quite large and ideal for cooking, as they tend to me more starchy and loaded with lots of healthy nutrients good for health. Just like avocados, if you want to increase your weight by using healthy food, adding plantains to your diet can help. It is generally believed that eating a ripe plantain everyday can improve your weight in a healthy way. One cup of sliced raw plantains contain 181 Calories. Plantains are also a very good source of potassium and also many important vitamins and minerals including Vitamin B6. Coming back to the topic, you can prepare really good quality banana flour at your home if you use good plantains. Neither ripe nor very raw plantains are used, but the plantains that are close to ripening are used to make the flour. If you touch, the fruits will be little soft, but not mushy. And the colour of the peel will still be green, but starting to fade in to a pale green. The fruits at this stage will be quite sweet too. Once you prepare the flour, it will be mostly naturally sweet, so you don't have to add any additional sweeteners. However, the sweetness cannot be guaranteed, since some plantains take longer time to become ripe and sweet. It looks like usual green bananas are also used by food manufacturers to produce the flour, even though I haven't seen anyone using them to make the flour at home. As you might have already heard, using green bananas in diet regularly may cause constipation in some people, similar to other starchy food like rice. When we use them for baby cereals, we don't give them everyday but most usually on alternate days so that it won't cause problems. If you choose the bananas by yourself to prepare the flour, you can choose bananas that are more close to the ripening stage. Green bananas are starchy fruits, with less sugar content. It is heart healthy and nutritious. The good thing with the green, unripe fruits is that they are do not increase the blood sugar level. In fact, the green bananas are good to regulate the blood sugar level and also the blood pressure level. You might be interested to read about 10 Ways To Use Cooking Plantains In Your Food. 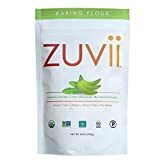 Since we are making the flour using only the green plantains, the sundried flour is expected to have the nutrients present in the green fruits. In simple words, what makes banana flour superior to most of the processed flours made from grains is that it is more nutritious and gluten free. However, I do not recommend replacing all the flours made of grains with banana flour, but adding banana flour to some of the food items that require flour can very much help to reduce the ill effects caused by grains. If you are usually fine with using ripe bananas and green bananas and if your diet is also rich with fibre rich foods, banana flour should be fine for you. However, just like any other food, you might have to find out that yourself. Once you have chosen the plantains at the right stage, which are about to ripe soon, the first and the most important job is done. The next step is to peel the fruits and then thinly slice them. The slices should be almost even and round. The slices will not stick each other and will not be too slippery, since the fruits are not yet ripe. Spread the slices evenly in a single layer in any mat or paper, and place this under direct sunlight during the day time. Make sure that the fruit slices are not exposed to rain. To make the flour, the slices should get full exposure to sun for few days. Once the fruit slices are dried really well, you can make sure that by touching and feeling the texture of the slices. At this stage, you can grind them into fine powdered form and the flour is ready to be used! It will be a good idea to prepare the banana flour during summer and storing it for using all through the year. You might wonder why you should make flour from bananas when you can use the fresh bananas. The purpose is to make a gluten free flour that you can use in some of the food recipes that you normally need flours made out of grains. The texture of fresh bananas and the dried flour is very different, and the latter has a distinct flavour too. You can easily use the banana flour to prepare cereal for babies, within minutes. The texture and consistency will be very similar to that of rice cereal, and in fact this is more tasty. If you are using banana flour to make baby food, make sure that you do not use it as a replacement for any other food, but you can use it as an additional source of nutrition. Also, as I mentioned above, it is better to give the banana flour cereal on alternate days so that it won't upset the stomach of little ones. I have never used banana flour to bake anything or to cook anything other than baby cereal and as a flavouring for milk. So I can't say how this would taste in baked goods like muffins and cakes. The reason why I have never tried it is that the banana flour I have is homemade, which I use just for my kids. Apparently, the flour is ideal for baking and cooking as well, and many people claim to have tried banana flour successfully in making pancakes, muffins and cakes. You might also like to check the below products. If you want to prepare the flour at home, you can either go the traditional way where you have to dry the fruits by exposing them in sun. Otherwise you can use an electric food dehydrator to make the process easy. Have you ever tried banana flour? While I would probably not make my own, I would enjoy trying this banana flour. I wonder if that which one buys is processed so much that it loses its healthy benefits. Hi Frank, I agree that banana peels have multiple uses. They are edible to be used in food as well as great for making compost. Hi burntchestnut, thank you for reading! I am glad you found something new from this article. 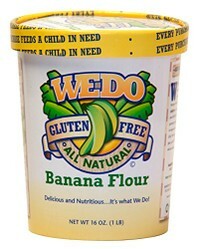 I think banana flour will be a better option to those who have nut allergies along with gluten intolerance. Hi sheilamarie, thanks so much for reading. You are right, it will be helpful to those who are intolerant to gluten. You are right that you can learn much on this site, which is one of the reasons that I love it. Little jewels of information, such as the use of banana skins for food are very precious. I was completely unaware that they could be used in stir fries. As I have no animals to eat the skins, I use my spare banana skins for compost. I'm always learning something new on Wizzley! I've never heard of banana flour before but have tried some flours made from nuts. I've never heard of making banana or plantain flour. I'll certainly try this as an experiment, as I have a family member who is gluten intolerant. Thank you so much for the suggestion! Hi Frank, thanks! I agree, banana skins are great ingredients of kitchen compost. They are edible too, the skin of ripe bananas are liked by animals like cows. The green banana skins are more tasty and healthy, and we use them to make stir fries. I did not know of the magnesium content, but the presence of both potassium and magnesium explains why banana skins are so important as ingredients of kitchen compost. They give much back to the soil. Hi Frank, thanks again! Other than potassium, bananas also provide a good amount of magnesium, a nutrient that is usually overlooked, but which is very much essential to prevent cell damage.